CoinHive may stull be the most popular and misused service for website owners willing to monetize their website traffic with visitors mining crypto, but it is not the only one. 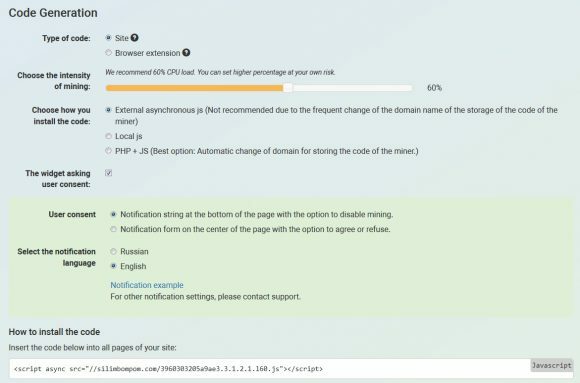 In fact there are others that are trying to implement the website mining in a less obtrusive way, giving webmasters more control and warning visitors and letting them stop mining. One such service that we have recently checked out is Grid Cash that uses a web-based Monero (XMR) miner. The service allows webmasters to fully customize the way the miner works, including control over the CPU load (resources used), so by lowering the usage you can easily make the miner less of a burden for the users. There are options to load the mining code locally, so it will not be easily blocked like when it is being loaded from a single remote host and of course the option to enable notification for users with an opt out feature. There is a detailed statistics available that helps you keep track of your earnings, though they depend a lot on how many visitors you get and for how long they stay on your website. We advise you not to try to abuse services like this one that uses your website visitor’s resources to mine for you as you’d most likely want to keep the visitors and increase them instead of driving them away, so proceed with caution when using services like these.